If there’s one way to beat the cold, it’s to keep moving. For Canada’s online brokerages, the sprint to the RSP contribution deadline is on and as a result they’re pulling out all the stops to keep the activity level high with new pricing, advertising and promotional offers. In this edition of the roundup, we profile yet another cash back promotion that launched last week, this time from an online brokerage that has been popular on the awards podium. From there we’ll look at some smaller developments that crossed our radar, including new ads promoting a revised commission plan as well as a platform outage that serves as a good reminder of the hazards of trading online. As always, we’ll take a look at what online investors were talking about online on social media and in the forums. Groundhog Day isn’t until February 2nd but anyone reading the Weekly Roundup will have noted that yet again, there is another new cash back promotion launched by a Canadian online brokerage. This time around, it’s Qtrade Investor, whose latest cash back offer brings the tally of this category of promotions DIY investors can choose from to 6. Qtrade’s is typically very calculated as to when it releases promotional offers, so it is particularly interesting to note how they’ve priced their offering, considering that they are one of the last online brokerages to do so ahead of the RSP contribution deadline next month. One of the first things that leaps out about their cash back bonuses is that it lags competitor firms in all deposit categories – especially so for deposits under $250,000. That said, Qtrade Investor has a unique advantage in the online brokerage space, namely that they have a reputation for strong finishes in all of the most influential Canadian online brokerage rankings. And, with the Globe and Mail online brokerage rankings just around the corner, their timing couldn’t be better. For that reason, Qtrade Investor has an advantage when it comes to reputation that can offset having to provide the “best” price for a cash back value – or at least that’s what they’re banking on. 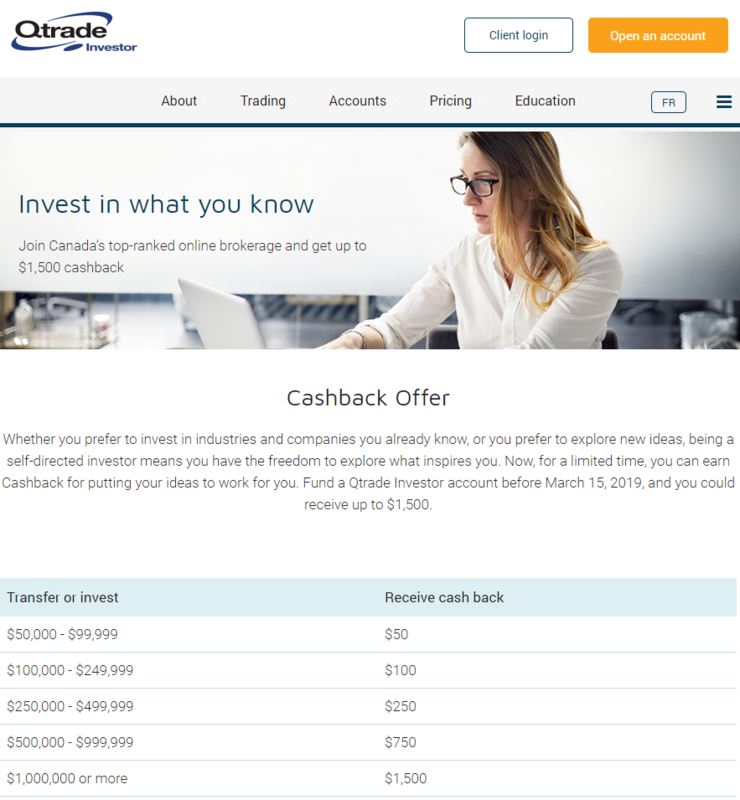 For DIY investors with $50,000 to deposit, for example, Qtrade Investor will have to demonstrate significant value when compared to BMO InvestorLine, for example, whose offer is $400 – or 8x more – than Qtrade Investor’s offer of $50. Another interesting observation about Qtrade’s promotional offer is that the deposit tiers are segmented the same way as other competitor firms, all the way up to the 1M+ category. So, although Qtrade’s offer lagged other cash back offers up to the $500,000 deposit level, they aggressively raised their offering at the $500,000 and $1M+ tiers. In fact, at the $1M+ deposit level, they are tied with Scotia iTRADE for the second highest cash back offer and have outbid HSBC InvestDirect – a strategic competitor in Western Canada – by a substantial margin at this deposit tier. In what is the tactical equivalent of a ‘limit order’, it appears that Qtrade Investor has clearly marked out where they see the greatest value in competing aggressively with cash back offers and where they are content to let investors enjoy a modest bonus. For DIY investors, the fact that one of the most popular and highly ranked online brokerages also now comes with a cash back promotion is a bonus. With the Globe and Mail online brokerage rankings just around the corner and a recent victory with the Surviscor rankings, online investors looking for a well-ranked online broker now have a little extra incentive to consider the brand. With just over a month to go until the RSP contribution deadline and almost all of Canada’s major online brokerages now offering up incentives, it’s a sprint to the finish line for DIY investors. Happy hunting! With the roll out of their new commission pricing and buzz starting to build around it, Virtual Brokers launched a new commercial featuring their latest offer. Targeting the mobile & texting crowd (e.g. millennials), this new ad stays true to Virtual Broker’s historical use of animated characters to describe their service offerings. While it won’t likely generate the same kind of buzz that either the Wealthsimple, Questrade or Scotia iTRADE ads have, it will nonetheless be interesting so see how this new ad starts to spark interest and curiousity among DIY investors who can’t help but find the prospect of $1.99 per trade (well technically per ticket) tempting. See the ad below. It seems like the beginning of a new year is a tough time for Canadian online brokerages. This year, it was Scotia iTRADE who suffered a trading platform outage during market hours. While crypto and weed stock mania can’t really be singled out as the issue, it is nonetheless an important reminder to DIY investors that online brokerages big and small can suffer from a wide range of connectivity issues. And, even though trading desks and call centres may exist, they’re not necessarily a great alternative if they get overloaded by large volumes of calls and emails. For DIY investors interested in capitalizing on commission-free trading, there is an interesting way to access popular passive investing ETFs XBAL and XGRO from Qtrade Investor and Scotia iTRADE. This forum post highlights to fellow forum readers the option to take advantage of these popular ETFs. For active traders, looking for opportunities to trade the markets sometimes stretches to pre or post market action. Unfortunately for one DIY investor posting in this forum on reddit, they learned that trading Canadian markets is limited compared to the US. That’s a wrap on this edition of the roundup. US markets will be closed on Monday for Martin Luther King, Jr Day. On our radar heading into the new week will be earnings for US online brokerages. After a healthy earnings surprise for Charles Schwab, eyes will be on Interactive Brokers and TD Ameritrade to see how recent volatility will translate into earnings as well as on what trends they’re seeing for DIY investing. Also, with the US Government shutdown still in the mix, the World Economic Forum (as well as a bunch of cannabis companies heading to Davos too) and lots of other earnings means traders will be looking for the markets win streak to continue.